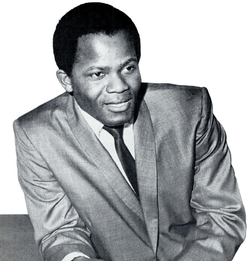 Joseph Arrington Jr. (August 8, 1935– August 13, 1982), better known as Joe Tex, was an American musician who gained success in the 1960s and 1970s with his brand of Southern soul, which mixed the styles of country, gospel and rhythm and blues. His career started after he was signed to King Records in 1955 following four wins at the Apollo Theater. Between 1955 and 1964, he struggled to find hits and by the time he finally recorded his first hit,"Hold What You've Got", in 1964, he had recorded 30 previous singles that were deemed failures on the charts. He went on to have four million-selling hits, "Hold What You've Got" (1965), "Skinny Legs and All" (1967), "I Gotcha" (1972), and "Ain't Gonna Bump No More (With No Big Fat Woman)" (1977). Joe Tex was born Joseph Arrington Jr. in Rogers, Texas in Bell County to Cherie Sue (née Jackson) and Joseph Arrington. He and his sister Mary Sue were initially raised by their grandmother, Mary Richardson. After Tex's parents divorced, their mother moved the siblings to Baytown, Texas. In high school, Tex played baritone saxophone in the school band and sang for a local Pentecostal church choir. He entered a number of talent shows and after an important win in Houston, the 18-year-old won $300 and a trip to New York City. While in New York, Tex took part in the amateur portion of the Apollo Theater, winning first place four times, leading to his discovery by A&R man Henry Glover, who offered to give him a contract with King Records. Due to his mother's strong convictions that he should finish high school first, Glover waited a year before Tex signed with the label at the age of 19. Tex recorded for King Records between 1955 and 1957 with relatively little success. He later claimed he sold musical rights to the composition "Fever" to King Records staff, due to failure to pay rent. The song's credited songwriters, Otis Blackwell (who used the pseudonym John Davenport) and Joe Cooley, disputed Tex's claims. Labelmate Little Willie John had a hit with "Fever", later inspiring Tex to write the first of his answer songs, "Pneumonia". In 1958, he signed with Ace and continued to have relative failures but was starting to build a unique stage reputation while opening up for artists such as Jackie Wilson, James Brown and Little Richard, perfecting the microphone tricks and dance moves that would define the rest of his career. It has been insisted by many, including Little Richard, that Tex's future nemesis James Brown stole Tex's dance moves and microphone tricks. In 1960, he left Ace and briefly recorded for Detroit's Anna Records label, where he scored a Bubbling Under Billboard hit with his cover version of Etta James' "All I Could Do Was Cry". By then, Tex's usage of rapping over his music was starting to become commonplace. In 1961, he recorded his composition, "Baby You're Right", for Anna. Later that year, James Brown recorded a cover version, albeit with different lyrics and a different musical composition, winning songwriting credit, making the song a hit in 1962, reaching No. 2 on the R&B chart. It was during this time that Tex first began working with Buddy Killen, who formed the Dial Records label behind Tex. After a number of songs failed to chart, Killen decided to have Atlantic Records distribute his recordings with Dial in 1964. By the time he signed with Atlantic, Tex had recorded 30 songs, all of which had failed to make an impact on the charts. Tex recorded his first hit, "Hold On To What You've Got", in November 1964 at FAME Studios in Muscle Shoals, Alabama. He was unconvinced the song would be a hit and advised Killen not to release it. However, Killen felt otherwise and released the song in early 1965. By the time Tex got wind of its release, the song had already sold 200,000 copies. The song eventually peaked at No. 5 on the Billboard Hot 100 and became Tex's first NO. 1 hit on the R&B charts, staying on the charts for 11 weeks and selling more than a million copies by 1966. Tex would place six top 40 charted singles on the R&B charts in 1965 alone, including two more No. 1 hits "I Want To (Do Everything For You)" and "A Sweet Woman Like You". He followed that with two successive albums, Hold On To What You've Got and The New Boss. He placed more R&B hits than any artist, including his rival James Brown. In 1966, five more singles entered the top 40 on the R&B charts, including "The Love You Save" and "S.Y.S.L.J.F.M." or "The Letter Song", which was an answer song to Wilson Pickett's "634-5789 (Soulsville, U.S.A.)". His 1967 hits included "Show Me", which became an often-covered tune for British rock artists and later some country and pop artists, and his second million-selling hit, "Skinny Legs and All". The latter song, released off Tex's pseudo-live album, Live and Lively, stayed on the charts for 15 weeks and was awarded a gold disc by the Recording Industry Association of America (RIAA) in January 1968. After leaving Atlantic for Mercury, Tex had several more R&B hits including "Buying a Book" in 1970 and "Give the Baby Anything the Baby Wants" in 1971. The intro saxophone riffs in his 1969 song, "You're Right, Ray Charles" later influenced Funkadelic's "Standing on the Verge of Gettin' It On". Tex recorded his next big hit, "I Gotcha", in December 1971. The song was released in January 1972 and stayed on the charts for 20 weeks, staying at No. 2 on the Hot 100 for two weeks and sold more than 2 million copies, becoming his biggest-selling hit to date. Tex was offered a gold disc of the song on March 22, 1972. The parent album reached No. 17 on the pop albums chart. Following this and another album, Tex announced his retirement from show business in September 1972 to pursue life as a minister for Islam. Tex returned to his music career following the death of Elijah Muhammad in 1975, releasing the top 40 R&B hit, "Under Your Powerful Love". His last hit, "Ain't Gonna Bump No More (With No Big Fat Woman)", was released in 1977 and peaked at NO. 12 on the Hot 100 and No. 2 in the UK. His last public appearances were as part of a revised 1980s version of the Soul Clan in 1981. After that, Tex withdrew from public life, settling at his ranch in Navasota, Texas and watching football games by his favorite team, the Houston Oilers. The feud between Tex and fellow labelmate James Brown took its origins allegedly sometime in the mid-1950s when both artists were signed to associated imprints of King Records when Brown reportedly called out on Tex for a "battle" during a dance at a local juke joint. In 1960, Tex left King and recorded a few songs for Detroit-based Anna Records, one of the songs he recorded was the ballad "Baby, You're Right". A year later, Brown recorded the song and released it in 1961, changing the lyrics and the musical composition, earning Brown co-songwriting credits along with Tex. By then, Brown had recruited singer Bea Ford, who had been married to Tex but had divorced in 1959. In 1960, Brown and Ford recorded the song, "You've Got the Power". Shortly afterward, Tex got a personal letter from Brown telling him that he was through with Ford and if Tex wanted her back, he could have her. Tex responded by recording the diss record, "You Keep Her", where he called Brown's name out. In 1963, their feud escalated when Brown and Tex performed at what was Brown's homecoming concert at Macon, Georgia. Tex, who opened the show, arrived in a tattered cape and began rolling around on the floor as if in agony, and screamed, "Please - somebody help get me out of this cape!" Tex would later claim that Brown stole his dance moves and his microphone stand tricks. In a few interviews he gave in the 1960s, Tex dismissed the notion of Brown being called "Soul Brother No. 1" insisting that Little Willie John was the original "Soul Brother No. 1". Tex even claimed Brown stopped radio disk jockeys from playing his hit, "Skinny Legs and All", which Tex claimed prevented Tex from taking down one of Brown's No. 1 songs at the time. During a 1968 tour, Tex had the words "The New Soul Brother No. 1" on his bus, leading to people heckling him. Tex immediately took the name off the bus and had it repainted. Tex even offered to challenge Brown to contest who was "the real soul brother". Brown reportedly refused the challenge, telling the Afro-American newspaper, "I will not fight a black man. You need too much help." While Tex moved on from his initial feud with Brown, Brown reportedly joked, "Who?" in his Bobby Byrd and Hank Ballard duet, "Funky Side of Town", from his Get on the Good Foot album, when Ballard mentioned Tex's name as one of the stars of soul music. A convert to Islam in 1966, he changed his name to Yusuf Hazziez, and toured as a spiritual lecturer. He had a daughter, Eartha Doucet, and four sons, Joseph Arrington III, Ramadan Hazziez, Jwaade Hazziez and Joseph Hazziez. On August 13, 1982, he died at his home in Navasota, Texas, following a heart attack, five days after his 47th birthday. Several other artists have covered Tex's work. Tom Johnston of the Doobie Brothers covered "Show Me" on his 1979 solo album, Everything You Heard Is True, The Monkees sang it in concert(lead sung by Micky Dolenz) from March to November 1969, and, in 1971, Barbara Mandrell had a country hit with it as well. Including the rock band Nazareth's "I Want To (Do Everything for You)" and Phish who performed "You Better Believe It Baby" on July 26, 1998, at the Starplex Amphitheater in Dallas, Texas and again on August 2, 1998, at Deer Creek Music Center in Noblesville, Indiana. Both the rock band The Trews and Lawrence "Lipbone" Redding covered "The Love You Save (May Be Your Own)"; The Trews on their acoustic album, Acoustic - Friends & Total Strangersin 2009 and Redding on his 2011 album, Unbroken. Johnny Cash covered Tex's "Look at Them Beans" in 1975. The UK band Q-Tips performed "S.Y.S.L.J.F.M. (The Letter Song)" regularly in its live shows. "I Gotcha" is used in both the film and soundtrack of Quentin Tarantino's Reservoir Dogs (1992). Tarantino also used "The Love You Save (May Be Your Own)" in Death Proof (2007). In The Commitments (1991), one of the characters is said to have claimed to have been in America recently and spoken to Joe Tex, but the one telling the story points out that Joe Tex died in 1982, whereas the events in the film are sent around the late 1980s. 1 2 3 4 5 6 7 8 9 10 11 12 13 14 15 16 17 18 19 20 21 22 23 24 25 26 "Bio - The World of Joe Tex". Retrieved July 18, 2012. ↑ "ARRINGTON, JOSEPH, JR. [JOE TEX]". Retrieved July 18, 2012. 1 2 3 Murrells, Joseph (1978). The Book of Golden Discs (2nd ed.). London, UK: Barrie and Jenkins Ltd. p. 183. ISBN 0-214-20512-6. 1 2 Murrells, Joseph (1978). The Book of Golden Discs (2nd ed.). London, UK: Barrie and Jenkins Ltd. p. 231. ISBN 0-214-20512-6. 1 2 3 Murrells, Joseph (1978). The Book of Golden Discs (2nd ed.). London, UK: Barrie and Jenkins Ltd. p. 322. ISBN 0-214-20512-6. ↑ "Ain't Gonna Bump No More (With No Big Fat Woman)". RockPopInfo. Retrieved June 29, 2014. ↑ "KGB, San Diego, California - Survey for week of Wednesday December 20, 1967". Ct30.com. Retrieved 2012-11-10. ↑ "No filler, no fat. Can't argue with this one, as it has all of his hits up to then. No B-sides, no album cuts. However, Atlantic should have put together a "Vol. 2," because his biggest hit of the sixties was right around the corner." James Porter et al., Joe Tex Album Guide, 2003; www.roctober.com. ↑ Whitburn, Joel (2003). Top Pop Singles 1955-2002 (1st ed.). Menomonee Falls, Wisconsin: Record Research Inc. p. 705. ISBN 0-89820-155-1. ↑ Whitburn, Joel (1996). Top R&B Singles: 1942-1995. Menomonee Falls, Wisconsin: Record Research Inc. p. 440. ISBN 0-89820-115-2. ↑ Betts, Graham (2004). Complete UK Hit Singles 1952-2004 (1st ed.). London: Collins. p. 779. ISBN 0-00-717931-6.